Our authorized distributor in Berlin, Germany is mediaservice rainer beddig, specialist for multiscreen projection systems. Barco, a global technology company, designs and develops networked visualization products for the Entertainment, Enterprise and Healthcare markets. eyevis is a leading manufacturer of visual display solutions for control rooms, presentation & information, broadcast applications, and VR & simulation. Norxe manufactures high brightness LED-illuminating projectors with solid state technology dedicated for simulation applications. domeprojection.com® supports ZEISS VELVET projectors to enable a perfect blending and auto-alignment solution including color calibration. ZEISS and domeprojection.com® solutions have been successfully used in many visual systems for the German Airforce. 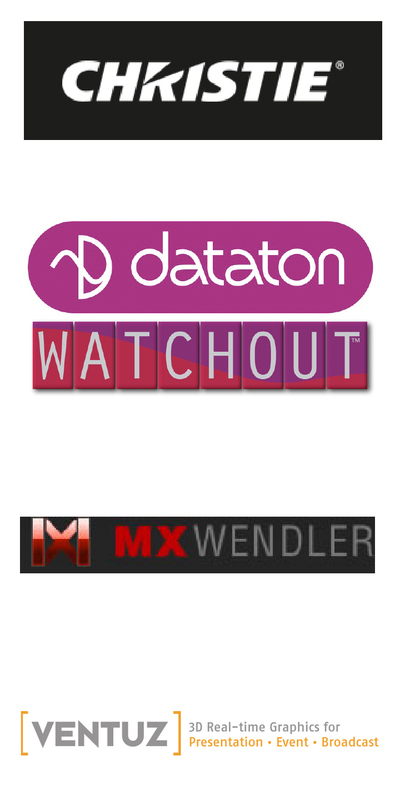 domeprojection.com® supports the newest version of Watchout by Dataton AB. domeprojection.com® supports MXWendler media server SW/HW. domeprojection.com® auto-alignment supports the newest version of Ventuz Designer. InfoComm International® is the trade association representing the professional audiovisual and information communications industries worldwide. Driving Simulation Association (DSA) is dedicated to the community of driving simulator developers and users. Fulldome Database is the online free resource of fulldome content, planetariums and digital domes, events and news. Otto-von-Guericke University Magdeburg and the STIMULATE research campus bring together research and development activities in Medical Technology.